Kathy: (From the bedroom) What do you think you do with whey? Mike: (From the kitchen and only partially listening) With what? Mike: Who’s doing what with whey? Mike: When is this whey, whatever it is? Kathy: At the cheese making class. Mike: Where is this whey thing being held? Kathy: (Entering the kitchen obviously frazzled by my Abbot and Costello routine) Who, what, when, where, whey? Really? Your cheese humor leaves something to be desired. What I was trying to tell you is that I’m bringing home the whey left over from the cheese making process and I need to find out what we can do with it. Mike: So you want to know what ways you can. . .
Kathy: Don’t do it. . .
Mike: . . . use the whey? Not wanting to disappoint a budding bread enthusiast, I did a quick Google search and within minutes had in my hand a recipe for five-minute artisan bread from the book Artisan Bread in Five Minutes a Day by Hertzberg and Francois. (See my version of the recipe attached). It looked simple to make and the only adjustment would be that I would add the whey in place of the water. Following the directions, I mixed the flour, whey, salt and yeast. The mix was easy to work with, and with the addition of the whey, smelled divine. After letting it rise for several hours, I tore off two grapefruit sized portions and let them rest on a cornmeal covered pizza peel. After 40 minutes, the loaves were dusted with flour, carefully sliced in a tic tac toe pattern and placed into the waiting oven. On the top rack sat a preheated pan that we poured water into, creating a good steam. Why someone hasn’t bottled the smell of cooking bread just before it is about to come out of the oven is beyond me. With the air thick with this aroma, I ran to grab the camera, having already decided that this was going to be one for ages. After placing the loaves back on the peel, and taking their picture like a proud parent on graduation day, I told Kathy that we were going to have to wait for them to cool down some before cutting a slice. We both then agreed that the time it took me to say that sentence was plenty of time and out came the electric knife (we have found this to be the best way to slice fresh bread without deforming it). It was a baking triumph that helped take the sting out of our recent cheese making tragedies. The extra bonus, of course, is that when we do dive back into the waters de fromage, even if we end up with ricotta rather than mozzarella, there will be plenty of whey on hand to kick up our pancakes, waffles, pizza dough and breads. How cool is that? That’s whey cool. When you are ready to bake it, cut off size desired and turn it in your hands to smooth the surface, stretching the surface and tucking in under. The top will be smooth and the bottom will be bunched. Dust a pizza peel or rimless baking sheet with cornmeal and placed the smooth loaves on it. Allow dough to rest in a warm place for 40-90 minutes, depending on size of loaf. Twenty minutes before baking, preheat oven to 450 degrees with baking stone or baking sheet on middle rack and an empty shallow pan on top rack (these need to get hot, too). Toss small amount of flour over top of dough and slash several times with serrate knife in tic tac toe or crosshatch pattern. Slide loaves into the oven. Quickly pour 1-2 cups of water into the shallow pan on the top rack and close the oven door quickly to capture the steam. 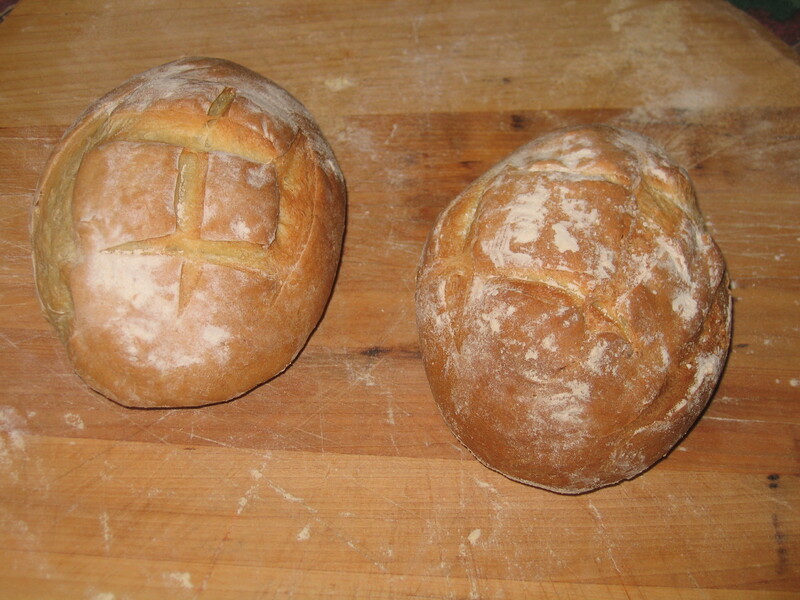 Bake for 30 minutes or until the crust is well browned and the bread sounds hollow when tapped on the bottom. Whey from cheesemaking? You live an exciting life and cheesemaking sounds fun. But back to the whey bread. Could the white unbleached flour be swapped out for another type of flour, say whole wheat or rye? Without first hand experience, I would say that you could use any flour but should make sure the amount of liquid is adequate. I would think whole wheat should substitute nicely. From what we learned at the cheese making event when you use whey in any recipe is simply gets substituted for whatever amount of liquid is called for. We had pizza dough made with whey tonite and it was great!